February 1, 2019 By David A. Sources close to the situation said that Bryce Harper met with San Diego Padres officials in Las Vegas on Thursday. The developments add another team to the list trying to obtain the services of the star free agent. The move for Harper fits together with several other possible moves the Padres are said to have in the works. This includes the pursuit of Manny Machado, the other “high-profile” MLB free agent. As well as that, they could make a trade for J.T. Realmuto, the catcher for the Miami Marlins. Why Bryce Harper interests the Padres is easy to understand. 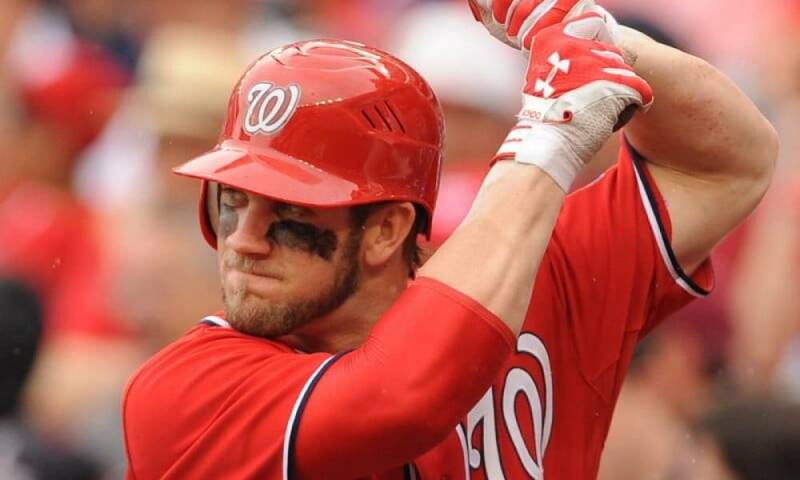 Despite having enough outfielders on the roster, the addition of the talented Harper improves a team considered on the rise. Want $250 to bet on MLB futures? How soon San Diego will start winning is important to Harper as the All-Star and former MVP rates San Diego with the other three teams still in the running for his services: Chicago White Sox, Philadelphia Phillies and Washington Nationals. Of course a big factor is how much San Diego is willing to pay Harper to have him sign a deal with them. San Diego was 66-86 in 2018 and thus far during the offseason has signed free agents pitcher Garrett Richards, who is injured, and second baseman Ian Kinsler who is 36-years old. However, the Padres have ample flexibility in their payroll and a farm system loaded with talent that includes top prospect shortstop Fernando Tatis Jr. The fact members of the Padres hierarchy traveled to Las Vegas, Harper’s hometown, shows serious interest on their part. While the markets for both Machado and Harper have seemed lukewarm at best this offseason, the movement by San Diego to enter the fray might start the ball rolling for the two super stars of baseball to sign new blockbuster deals.